Nature’s Herbs Wild Countryside Chickweed herb grows wild in the fertile valleys of Europe. Chickweed is used by many cooks today as a tasty salad green. It is highly valued and respected in many parts of the world. Though chickweed got its name from its reputation as a popular food source for chickens, humans also enjoy the taste of this nutrient-rich weed in salads. Chickweed has also been used for centuries as a popular herb. 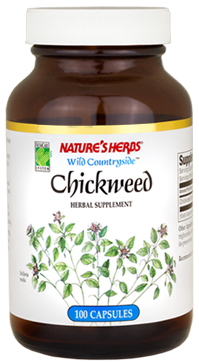 Nature’s Herbs Chickweed is a natural source nutritional supplement that delivers 1,155 mg of chickweed per serving. If you are pregnant or nursing, taking any medication, or have any medical condition, consult a health care professional before use. KEEP OUT OF REACH OF CHILDREN.